Does the iPhone 5's possibly metal backplate preclude the inclusion of NFC? A new report claims to have indisputable evidence that the iPhone 5 will not feature near-field communications (NFC) technology. NFC allows for easy mobile transactions, and it's been adopted by a wide range of device manufacturers over the last few years. Apple, as always, has remained tight-lipped about the new iPhone, which is expected to be introduced on Sept. 12. But bloggers have pointed out that recent revelations about the iPhone 5 make the inclusion of NFC seem highly unlikely. 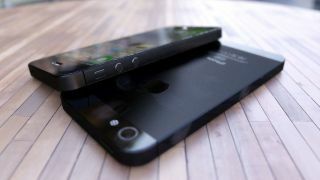 Back in May some leaked photos appeared online that allegedly proved that the iPhone 5 will replace existing iPhones' glass backplates with a metal one. At the time, TechRadar speculated that the material change could be meant to help facilitate NFC communications in the iPhone 5. But bloggers at AnandTech and The Loop agree that given the metal chassis, "it's highly unlikely that NFC is in the cards for this generation." "In fact, given the very little space at top and bottom dedicated to those glass RF windows, you can almost entirely rule it out," AnandTech writes. But there's plenty of evidence to suggest that Apple has some plans for NFC, whether or not it will be included in the iPhone 5, and most of it can be found in patents filed by Apple. The first concrete hint that Apple was tooling around with NFC came early in 2011, when an "e-wallet" icon appeared in an image included with an unrelated patent. Then, in May 2012 an Apple patent for iTunes gifting via NFC was uncovered. CNET reported on Tuesday that Apple had mentioned NFC in another patent related to mobile payments. And perhaps most damning of all is a leak on Monday of images that allegedly show a partially assembled iPhone 5, with what looks like an NFC chip clearly visible. The iPhone 5 would certainly benefit from the inclusion of NFC, especially given iOS 6's new e-tickets service, Passbook. But it's impossible to know for sure whether Apple will include NFC in the iPhone 5 until the device is officially announced, possibly on Sept. 12, though even that isn't certain. Way to keep us guessing, Apple.